There's always something new to find in the Phuket area! Just about a year ago (May 2016) we found a newly opened viewpoint in Phang Nga, not far from Phuket, called Samet Nangshe - and it was quite a find, hardly known a year ago, but now on quite a few tour itineraries and websites. 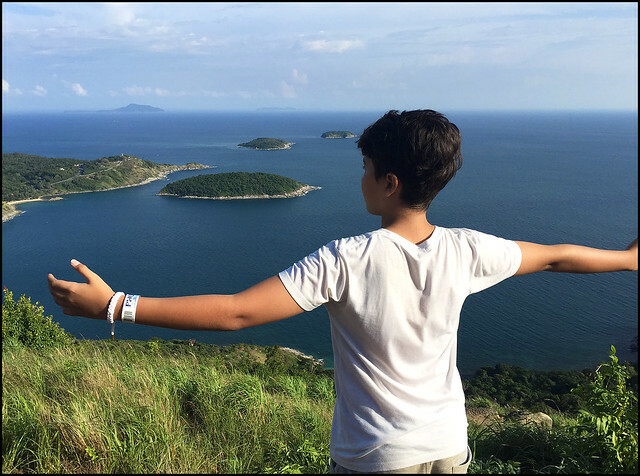 There are a lot a great views in Phuket, some are advertised viewpoints, some need a bit of a hike! Now, this new viewpoint which we can call "Black Rock", or maybe "Black Cliff" - the Thai name means "Black Rock Cliff". I've not seen an official name in English, not seen this viewpoint on any English websites or blogs, although I first heard about it 4 years ago, but was asked to keep it a secret, and until last weekend I never got around to visiting! Well, the secret is out already. 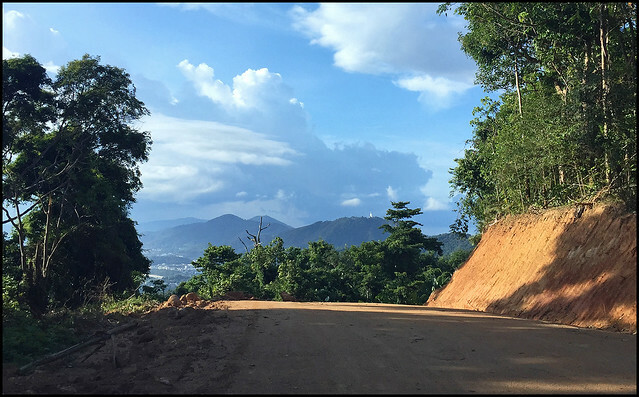 Do a Google search in Thai for ผาหินดำ, and you find plenty of pictures and videos, plus the road heading there has been improved and signs are up (in Thai! ), so I think I can safely blog about Black Rock or Black Rock Cliff or Pa Hin Dam without spoiling the place! Anyway, it's still not that easy to find, there's not even a drinks stall, no signs in English and a dirt road followed by a short hike uphill. Very glad we went and let's see how developed it gets in the coming year. The viewpoint is above Naiharn beach, reached by a dirt road that starts not far from the Karon Viewpoint. 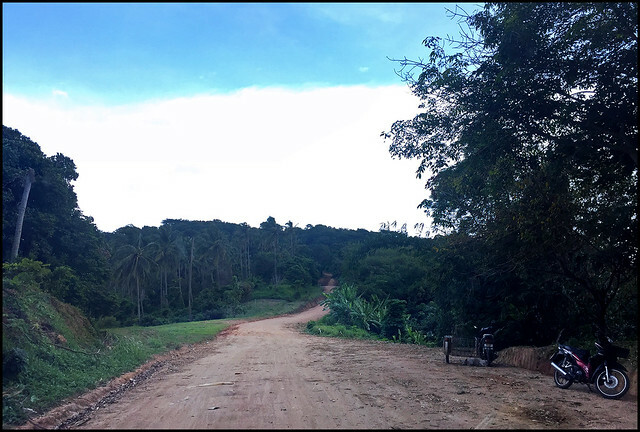 It's the same dirt road that heads towards Nui Beach - a private beach that I have never been to, partly due to the steep dirt road, partly due to the compulsory entry fee. It was made into a "beach club" and was being investigated for land fraud, was raided by the navy, but I think it's still open! This dirt road has been improved recently. 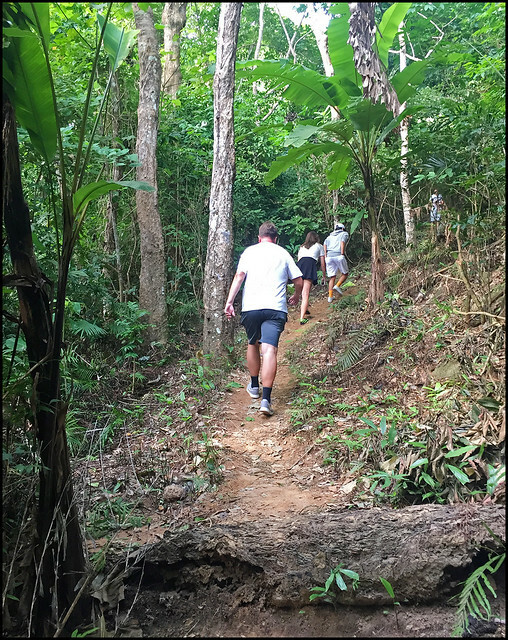 It's only about 1km along the dirt road which is signposted to Nui beach, then you keep left while the road to Nui heads right and steeply downhill! 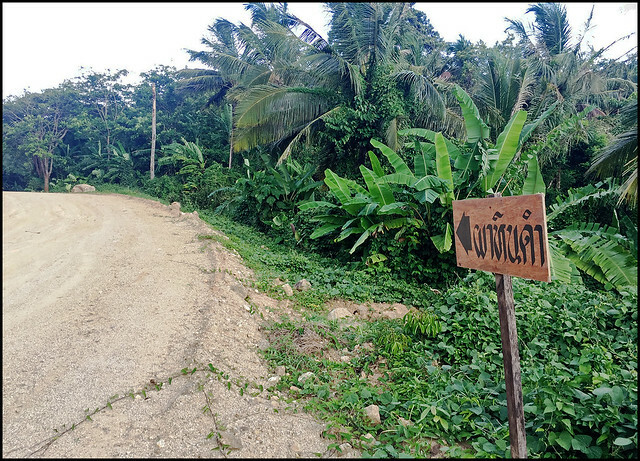 (above) When the road splits to Nui beach, keep left and follow to the sign to ผาหินดำ! 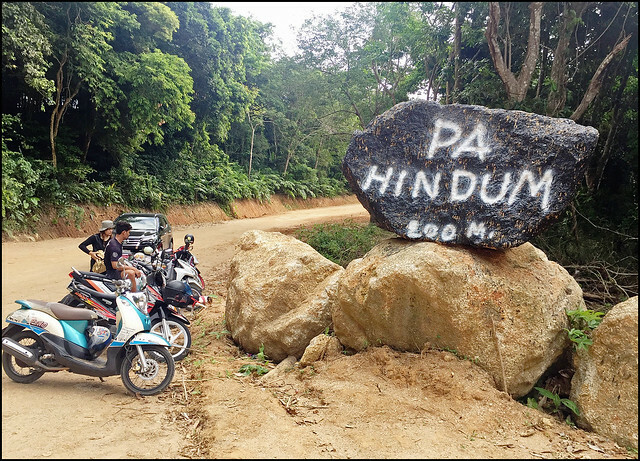 Not much more than half a kilometer along the left turn we found a very obvious landmark - a big PA HIN DUM painted on a rock. A bunch of mopeds and a couple of cars were parked there. So the place is certainly known .. just not very well known yet. So, at this point we parked our truck and followed a small path up into the trees on the left side of the road. Not a long walk to the top, only about 10 minutes. The path is obvious enough, no proper steps, just a narrow forest path which runs alongside a barbed wire fence for a while. A few sections are kind of steep, watch your footing, but really nothing to break a sweat. (above) A little hike up to the viewpoint. It's really quite high up here - something like 290m (nearly 1,000 feet) above sea level. YOu're looking south and Nai Harn and Ya Nui beaches are way below. The wind turbine lookout between those beaches seems quite high when you are there, but it's waaaay down there! 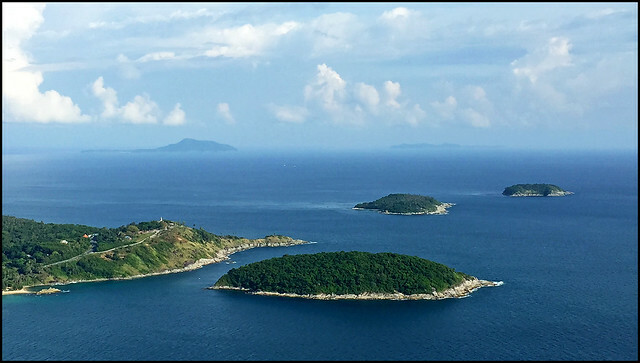 You can see Phromthep Cape and islands beyond including Koh Kaew Yai and Racha Yai islands (Racha Yai is 20km south). Please note - there's not so much room at the viewpoint here, and the cliff drops off very very steeply, I advise caution! There's no railings or warning signs, just don't go jumping around near the edge! You can walk carefully down a few meters onto a small flat area just before the cliff, but do it carefully! And here's a little iPhone video at the viewpoint. I think I will come up here again for a sunset. We stayed up there taking in the view for about 20 minutes and then headed back home. 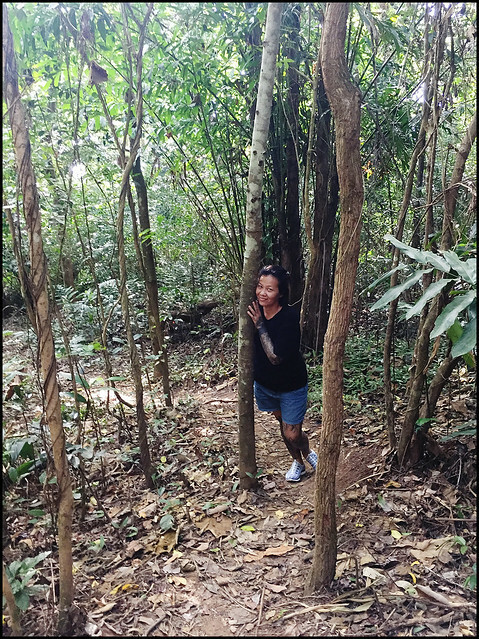 This is what the Phuket blog is all about - exploring and finding new places in and around Phuket. Going the other way on the dirt road we had a nice view looking north along the hills. 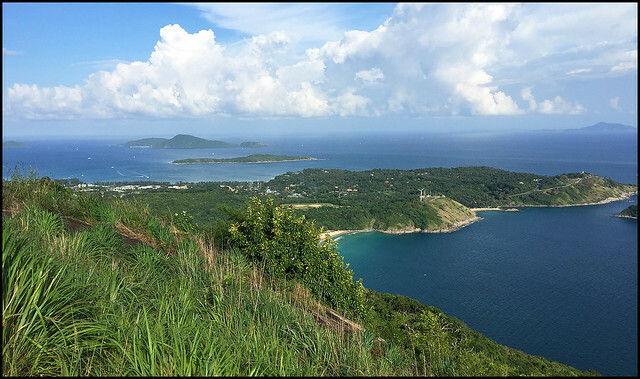 Phuket has plenty of hills, which is actually how the island got it's name - the Malay word for hill is Bukit. So, let's see how long this place stays quiet! Looks like the landowner has made access much easier now, with the dirt road being improved and the viewpoint being signposted. Easy enough to find, if you know where you are going! Many other viewpoints in Phuket are easier to reach!